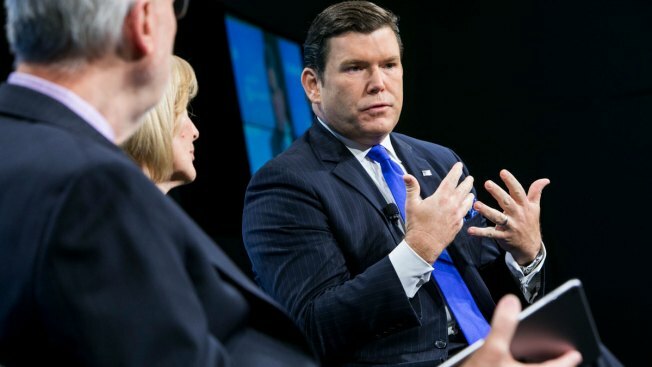 Baier says first responders got them to a hospital quickly, from which he says they left "banged up but alive"
Bret Baier, Chief Political Anchor, Fox News, participate in a discussion during the Washington Post Live event: Americans and the Media: Sorting Fact From Fake News. Baier and his family escaped serious injury in a recent motor vehicle crash. Fox News host Bret Baier and his family have survived a motor vehicle crash in Montana. In a statement released Tuesday, the anchor and executive editor of Fox News Channel's "Special Report" says that after a weekend of skiing he was driving to the airport on icy roads with his wife and their two sons on Monday morning when they were "involved in a major car crash." The 48-year-old says a passing motorist named Zach stopped and the family was able to climb out of the flipped vehicle. He says first responders got them to a hospital quickly, from which he says they left "banged up but alive." Fox says Baer is expected to be back on the air Tuesday night. He did not say where the accident occurred.